Review: Do not let the beautiful cover fool you like it did me. The world in which The Belles live may look like a dream come true from the outside looking in but when you bury yourself into those pages and submerse yourself entirely into their world, you learn it's all just a facade. The way things work in the world of The Belles are all oh so very dark and twisted. It did take a while for me to really get into the book, not saying I didn't find the slower parts interesting because I did, but it didn't become a true page turner for me until the plot really kicked up and people started showing their true colors. I loved the vivid come to life writing by Clayton, I mean the way she described scenes and people and places was almost kind of poetic, I couldn't get enough of it. 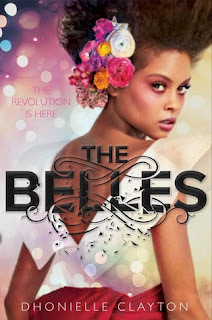 The characters in The Belles will infuriate you, some you will love, others you will feel a great deal of sorrow for and then some you will love to hate. Through her characters Clayton really shows the ugliness behind a society who cares too much for beauty, I know our beauty-obsessed society is nowhere near as bad as what is in this book but it's a little scary to think what if we had Belles in our world would we go as far as the people in this book do. A great conversation starter in my opinion. I am a little upset with the way things left off, okay I'm devastated and I get it cliffhangers keep us coming back because we need our damn closure and boy did this book have one hell of a cliffhanger. I need the book gods to bless me with the next book in the series like yesterday. I am very excited to see what happens next, the ending was intense and I have so many questions and let me put it like this for all of you, nothing was resolved at the end...nothing. Overall I highly recommend it, I just wish I had read this closer to the release of the next book.